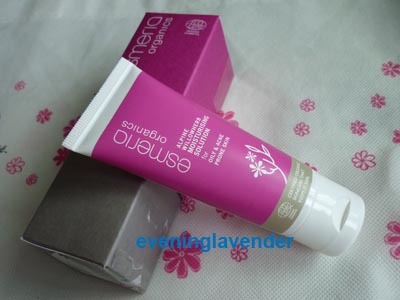 I am sure some of you have heard of Esmeria Organics. 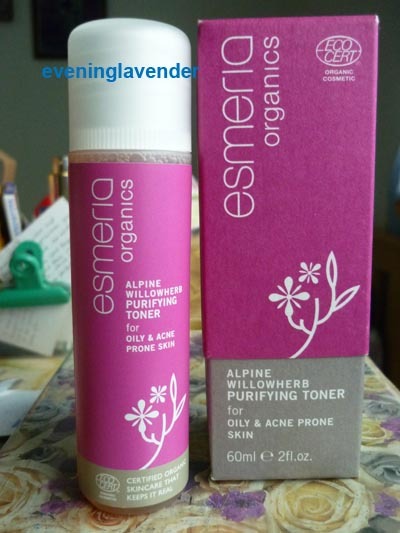 Esmeria Organics is made in Malaysia. I am really happy because this is the first Malaysian skincare brand that is certified organic by EcoCert, the French-based international organic certification body known for its stringent certification standards. Esmeria Organics not only is the first Malaysian company to receive EcoCert’s stamp of approval but also the first in South East Asia. I am so proud to know this. For those who are not aware, EcoCert requires that 95% of the ingredients used in any product to be of natural origin and has extremely strict restrictions on what is allowed in the remaining 5%. Furthermore, for a product to be certified organic, 95% of the plant ingredients must be of certified organic origin. For those who are living in Malaysia, you will find that Organic skin care products are very expensive as most of them are imported from overseas. As a lover of organic products, I am really thrilled to learn that we finally have a home grown organic skin care range that has EcoCert certification without the hefty price tag! 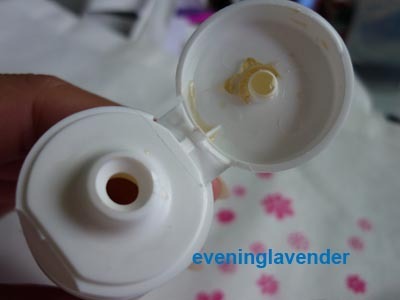 At first I do not appreciate why the facial cleanser is not in a pump packaging as the texture is very fluid and difficult to control the amount to dispense. However, after reading the product literature provided by the PR company, I learnt that Esmeria Organics products are packaged in recyclable boxes and containers. Products are only boxed where necessary and its packaging avoids the use of materials that are less environmentally friendly. For example, pumps cannot be recycled as they contain metal and glass and although made from sand, it takes a lot of energy to produce and ship due to its weight. 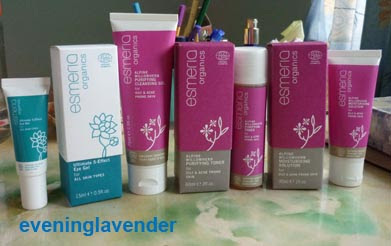 The Esmeria Organics face care range can be personalized with the 3-step cleanse, tone and moisturize concept. Products are available for those with normal to oily skin, oily and acne-prone skin and dry skin. The Glasswort range of skincare is for dry, dull and mature skin. Glasswort is found in the Mediterranean and Atlantic coasts. Its extract called Hydrasinol provides essential hydrating properties to hydrate, protect and reduce moisture loss. The Prickly Pear, which is a type of cactus, is for normal to oily skin or otherwise known as combination skin which is the most common skin type in Malaysia and Asian countries. It hydrates, soothes and protects the skin from UV damage. This is combined with other advanced bio actives to reduce the production of sebum especially on the T-zone. The Alpine Willow Herb range is for oily and acne-prone skin. Acne and over-production of sebum is the result of environmental aggressors, blocked pores, bacteria and even overexposure to UV. The Alpine Willow Herb has capabilities to control production of sebum and acne-causing bacteria. It also protects from environmental aggressors and UV damage. According to Esmeria Organics, after continued use, skin will be visibly less oily and pores will become smaller. As I have oily skin, I was sent the Alpine Willow Herb range for review. What I like about Alpine Willow Herb Purifying Cleansing Gel? Note: Due to the watery texture, you must be more careful when dispensing the gel. The product packaging (the opening) is a little too big and may cause product wastage. Do not squeeze the tube as it will over dispense. What I like about Alpine Willow Herb Purifying Toner? What I like about Alpine Willow Herb Moisturizing Gel? 2. The transparent gel texture is easily absorbed into the skin.There is no oily feel at all. Note: I will be reviewing the eye gel and other products in Part 2. Esmeria Organics can be found in select pharmacies and organic stores. For further information, please visit www.esmeria.com . I loved the cleanser, but the found the toner and moisturiser too sticky.